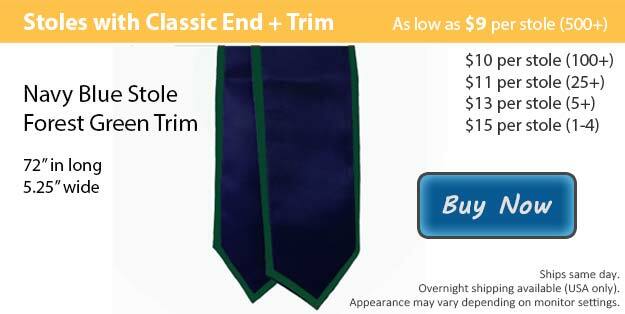 Our navy blue stole with forest green trim is an outstanding choice, the dark colors make for a splendid final product that any student will be happy to have. Graduation is a day that you will not forget anytime soon. You have worked extremely hard over the last few years to reach your goals. Here at Honors Graduation it is our mission to help graduating students to be fully prepared for their big day. Usually, students who are graduating follow a tradition that has been in place for many years. Graduating students dress in a graduation cap and gown at the time of their ceremony and have also been known to accessorize their wardrobe too. Here at Honors Graduation we have all the things that you will need to make your graduation outfit absolutely perfect. We have some handy deals that include the basic essentials that you need as well as plenty of accessories to help you achieve the look you are going for. In addition to your robe and cap, it is common for graduates to wear something that symbolizes their role in the group or club that they are apart of. Our graduation stoles are a fabulous way to represent yourself during your ceremony. Our graduation stoles come in various shapes and sizes. We have two types of finishes for our stoles, the angled cut or the classic option. Both of which are available in 60 or 72 inches. We also have 18 different colors that you can select from letting you pick the best two colors to represent yourself. Each of our stoles are available with or without the trim. If you wish to add an image or wording to your stole, our customization team can embroider your stole to create your stole just the way you want it.